There are many health benefits found in the inverted poses. Any time your heart is above your head, you are in an inverted yoga pose. 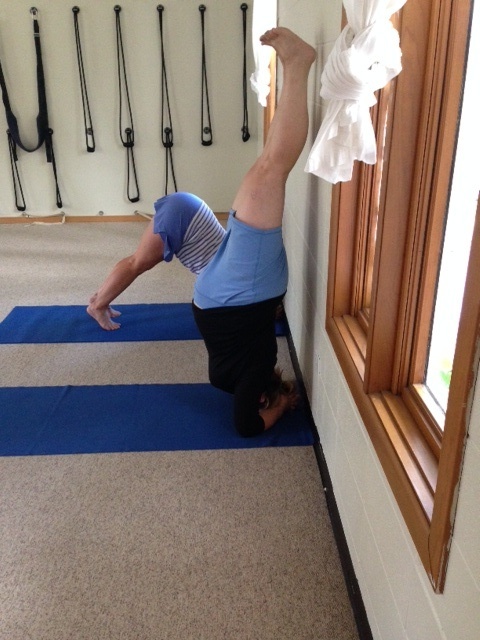 This could be downward facing dog, or legs up the wall, or the more challenging headstand, handstand, and arm balances. We walk around and stand on our feet all day, so when we invert, the circulatory system gets a little boost, gravity helps move the fluid in your lower body – it drains better to the veins and lymph vessels, helping to clear up congestion in all parts of the body. Yoga, particularly inversions, can help enhance immunity, notes a review published in a 2008 issue of the International Journal of Yoga. Authors Sarika Arora and Jayashree Bhattacharjee, biochemists in New Delhi, India note that a pose like Downward Facing Dog improves the flow of fluid in the sinuses and can flush mucus from the lungs. Forward bends may have similar benefits. 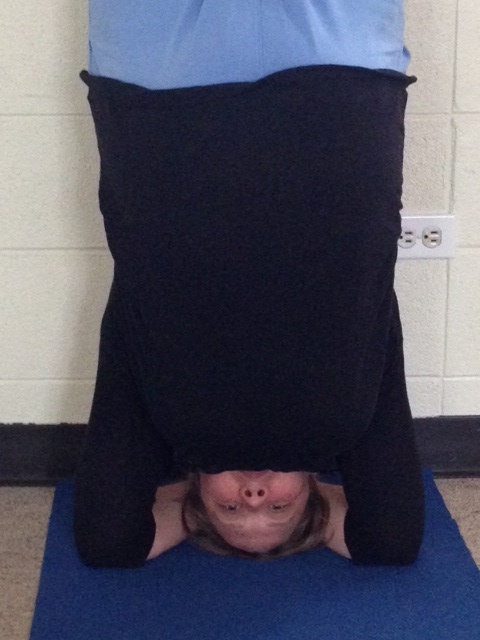 Inversions may also enhance functioning of your lymphatic system, which plays a role in immune response. Legs Up the Wall pose, called Viparita Karani, is a simple example of a lymph-stimulating inversion. Inversions also enable the heart to rest from the work of constantly pumping blood. Research shows that a yoga practice that includes inversions can boost your mood and improve the symptoms of depression and anxiety. 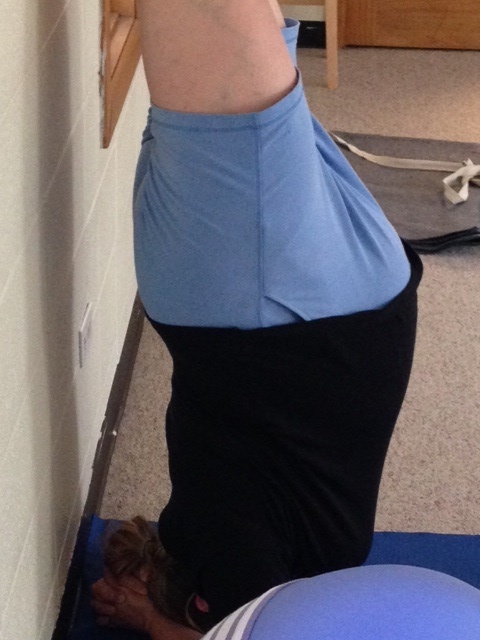 Above photos – Lisa (32 weeks pregnant) in headstand. The benefits of inversions go on and on, they are great for your endocrine system, integumentary system, digestive system, urinary system, respiratory system, skeletal system and muscular system, besides your circulatory and immune systems. Inversions shouldn’t be practiced by everyone however, check with your yoga teacher and doctor if you have a chronic condition such as high blood pressure, glaucoma or epilepsy, which are contraindicated for yoga inversions. Inversions can be great during pregnancy too. If you did not practice inversions before pregnancy, it’s not wise to learn inversions during pregnancy. However, if you practiced inversions comfortably before becoming pregnant, it’s probably beneficial to continue the poses through pregnancy. Promotes hormonal balance by increasing blood flow to the head and neck. This is especially good for the thyroid gland, as a deficiency in thyroid hormone can lead to miscarriage. If you want to read more about the benefits of inversions to your yoga practice, here is an article: 10 Benefits of Yoga Inversions. At home, it’s simple to put your legs up the wall and give your body a little immune boost! In class, under your teacher’s supervision is a great time to try headstand, shoulder stand, and handstand. 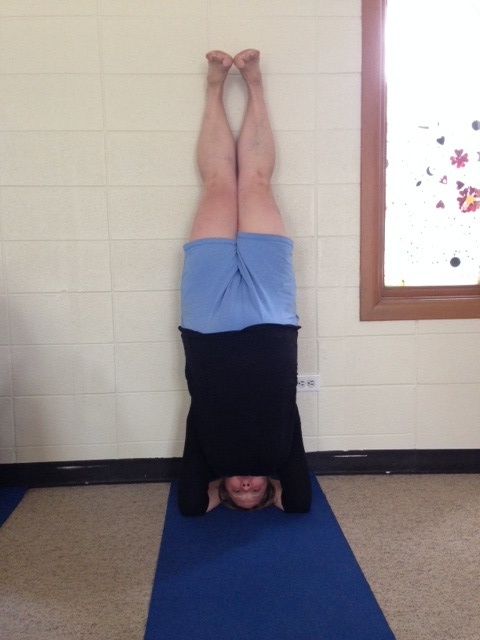 See you soon, maybe even upside-down, at the Aurora Yoga Center! Beautiful front garden at the AYC in its Summer time glory. Summer is for Flowers – Be sure to stop by and see what is blooming, the garden is ever changing and so fun to watch. Summer perennials – purple cone flowers, hollyhocks, & more. 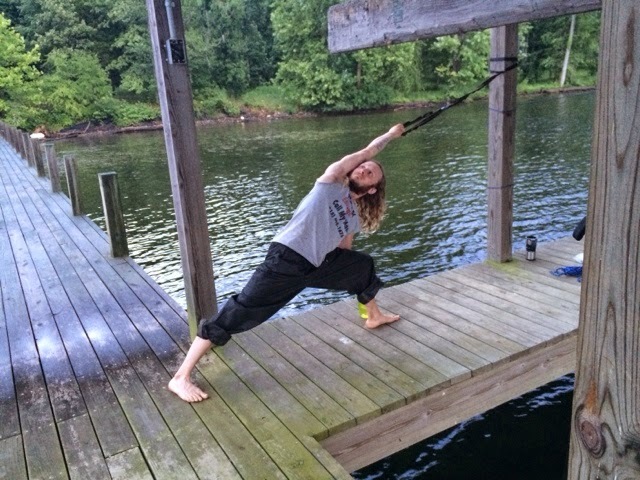 Yoga teacher Pete takes a break from his 1,000 mile canoe trip to take a side-angle pose and stretch those sore muscles! Summer is for Adventures – make sure to follow Pete and his best friend Nolan on their blog. It’s fun to read and see the pictures – you can donate to their charity as well, they are getting closer and closer to raising $10,000 for the American Diabetes Association. Summer is for tie-dyed t-shirts – Another way to support Pete and Nolan’s paddling journey is to buy a one of a kind – hand-dyed and original, new Yoga Bones design shirt – just for this Summer’s Paddle to Cure Diabetes journey! Yoga Bones shirt at the Sox game. Summer is for baseball – Hope you are enjoying your summer! – It goes by so quickly!